To think that in the day or two prior to the Hungarian Grand Prix the air was thick with wrestles of how to make F1 more entertaining. Some crisis meeting or other was being held among the teams; some action group or other was to be formed. As always seems to be the case at such moments, the suggestions floated were somewhere in the vicinity the absurd. Success ballast - F1 steps further away from being a sport and further towards being WWE - for one. Even more worryingly apparently rather a lot of team bosses liked the idea. But on today's evidence any such think tank can now knock off early. Whatever this sport's problems are there is not a great deal wrong with what F1 serves up for a couple of hours on a Sunday afternoon. In that regard you rather wonder what exactly it is that all these luminaries are worrying about. To think too that - following the events of qualifying - this was supposed to be a Nico Rosberg benefit also. It did indeed look that way in the race for a while, but the thing rather pivoted against him partway through, meaning in the end he was but one of a number of stars of the show. Also - very much against expectations - his team mate and 'competitor number one' (Nico's words) Lewis Hamilton gained a bit of points ground on him. But the Hungaroring race was just our latest reminder that whatever a qualifying session throws up it still means nothing is for certain beyond the starting order. No points are handed out then. And this race provided our latest reminder too of the perils of extrapolating too far ahead. Especially so within this rather corkscrew 2014 F1 script. As no matter how confident we are in assuming how a race will unfold, still plenty of variables can be thrown into the mix. This time it was a very old one. Rain, combined that is with a fairly new-ish one of safety cars, which rather split strategies, and thus shuffled the deck more than once. Weather forecasts had for some days predicted storms to arrive sometime around the time of the race. Sunday morning started out fine, but then nasty looking clouds crept along, and what seemed like an indeterminable wait followed; all poised for the worst. And sure enough the rain arrived in large quantities around 40 minutes before the race start. It stopped about as quickly but the track was saturated for the get-go. The 15 minutes between the pit lane opening and closing became in effect an acclimatisation session and conditions clearly were treacherous, as evidenced by plenty of lairy moments, some off track. Nevertheless it was inters all round at the start. But early on even with the rain matters looked of the terribly familiar sort. Pole man Rosberg in his Mercedes appeared on another level. He led off the line and his lead grew like this: 2.6 seconds after a single tour, then 4.1, 5.7, 6.7, 7.8, 9.1, 9.1 (on a lap that he slid off at turn one and continued), 10.5. While all of this was going on both Red Bulls - Sebastian Vettel in P3 and Daniel Ricciardo in P6 - were bottled up by a Williams and McLaren respectively. It looked, rain or shine, a Merc rout. But on that lap 8 Nico's day went wrong. Marcus Ericsson binned his car in a big way at turn three, necessitating a safety car. All (aside from the too clever by half McLaren operation) decided also that it was a good time to stop for slicks also, but the top four - Rosberg, Valtteri Bottas, Vettel and Fernando Alonso - missed the pit entrance and got bottled up briefly behind the safety car while those behind got their service a lap earlier. 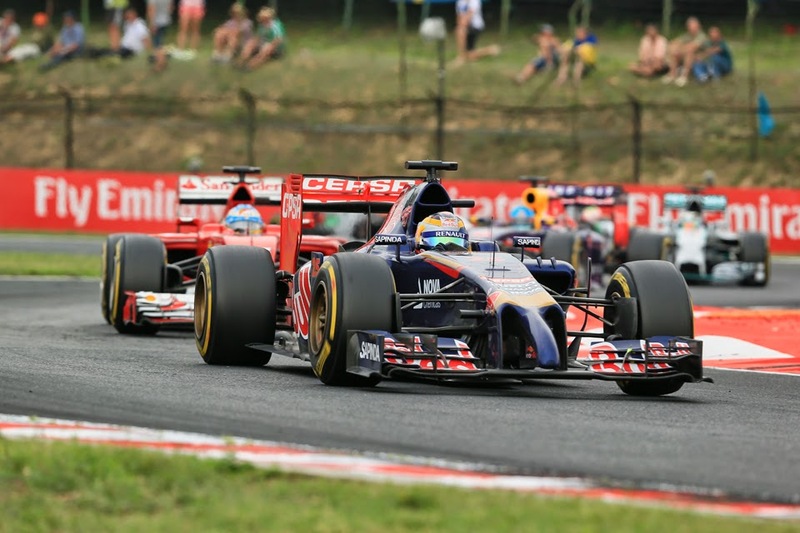 The quartet thus emerged in the pack, and Ricciardo now led. Yes, after his latest bout of ill-fortune in qualifying and subsequent pit lane start Lewis was as ever making robust progress. His day nearly was over within but two corners, as he lost it under braking for turn two (presumably a consequence of not being able to warm up his brakes given his pit lane start) but merely tapped the barrier rather than destroy his W05 on it. From then on he needed no luck. Ricciardo meanwhile appeared in control, in clear air he disappeared off out front, while Alonso showed many of his considerable skills by sliding up to P3 - Felipe Massa between - in the greasy conditions, overturning his pitting a lap too late behind the safety car deficit in no time. Then another safety car appearance on lap 23, this time brought about by Sergio Perez spearing into the pit wall after getting too wide on the last turn, lobbed in another variable. This time Ricciardo - along with both Williams - decided to pit again for more tyres while Alonso and all others pressed on with the rubber they had. It wasn't clear at this stage how the strategies would unravel but Ricciardo would have the benefit of fresher boots, though on the flip side now was in traffic in P6 and clearly needed to do more of the overtaking. 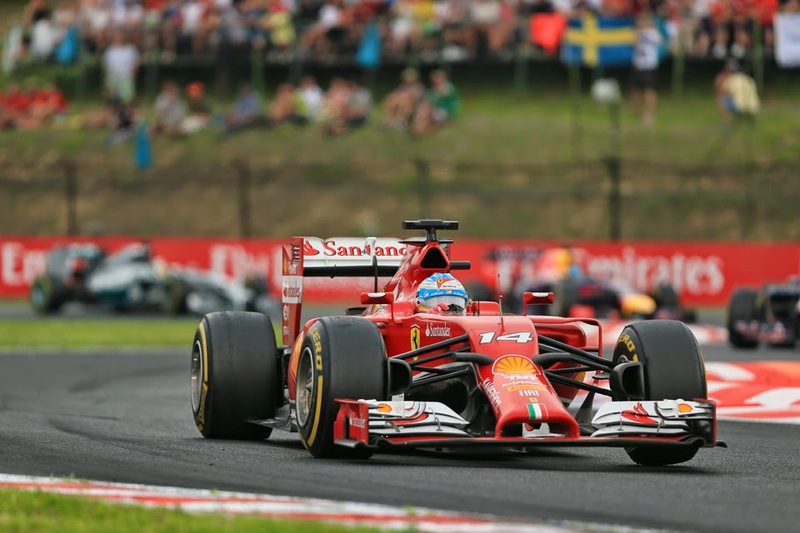 Once the safety car cleared off Alonso now in the lead edged clear, with Vergne in an amazing second place keeping the rest away. Then Rosberg's race got further difficult as he pitted for new tyres just six laps after the latest safety car went in, which not helped by the stop being a tardy one sank him to P13 and with much before him - metaphorically and literally. Hamilton a couple of laps later got himself a free run at Alonso thanks to a brave and fine - classic Hamilton indeed - move around the outside of Vergne at turn four, and when the Frenchman pitted on the next lap we had three in fairly close company at the front - Alonso, Hamilton, Ricciardo. The varying strategies of the trio still had to play out however. Alonso seemed to hit the cliff with his Pirellis and thus pitted and took on more softs after 38 laps, and a mammoth 32 to go. 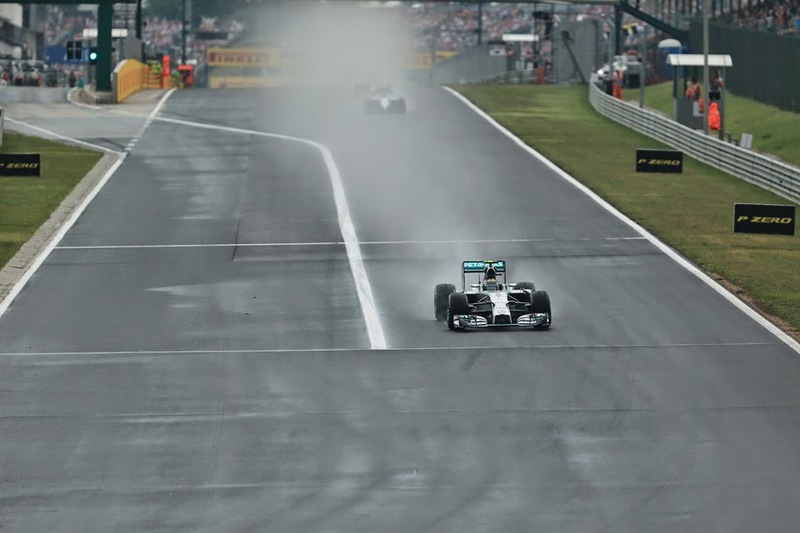 Hamilton pitted himself a lap later and took on mediums - clearly minded to go to the end on that set. Ricciardo now led but evidently had another stop to do. Alonso's intentions were less clear. Ricciardo did indeed pit with 15 laps left, to leave Alonso back in the lead and Hamilton not far behind. Ricciardo was about nine seconds back in P3 but closing rapidly. Alonso's conundrum was thus - pit and get an easy fourth place at least, or press on and risk once again 'hitting the cliff'. But possibly win. Said like that it's no wonder he took the option that he did. Alonso was going to tough it out. Before we knew it the three were circulating as one pretty much; three diverging strategies converging in the late laps. Make that four as very late on too a freshly-booted Nico Rosberg started to close on the train at breakneck speed also. But Alonso as ever was showing little sign of giving anything away. A red car piloted by a magical driver in the lead and against all credibility holding off a load of quicker cars was redolent of Villeneuve, Jarama, 1981 and all that. The Spaniard's tyres were long past their best, as to some extent were Lewis's, and as the laps ticked down the impossible of Alonso hanging on began to look a creeping possibility. 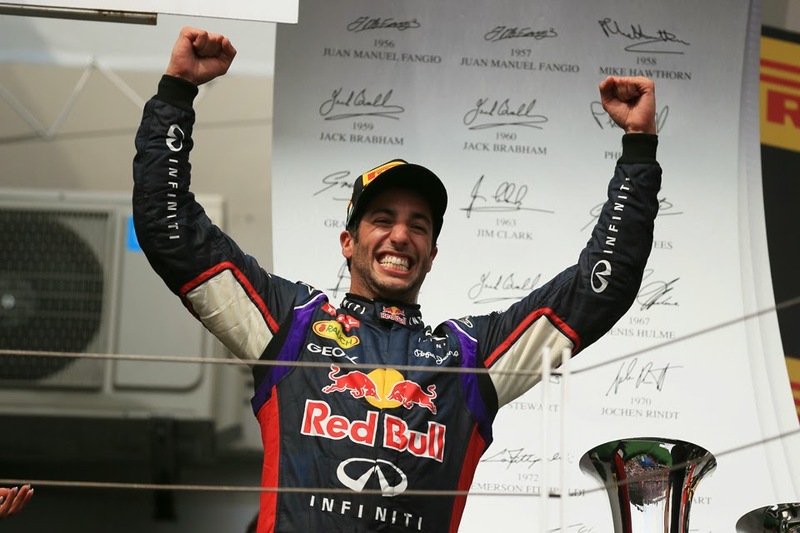 But Ricciardo was determined to have the final say. And he did. With four laps left he brilliantly elbowed his way past Lewis into turn three having not flinched when running around the outside of him at the previous corner. By his own admission with two fast in a straightline Mercs behind him Ricciardo couldn't afford to hang around, 'I knew we had to make a move quick, the DRS was there and I know it could have been my only chance, so I took it and it paid off. Had to be done' he said. Sure enough at the start of the next tour he smartly outbraked Alonso into turn one, and then left him by the tune of three seconds by the end of that lap. First place was sorted. Thus Ricciardo's second Grand Prix win was a lot like his first: hanging within a train of cars, the one at the front compromised, then striking in a devastating fashion right at the optimum moment, when such a strike always going to decisive; his opponents least equipped to react. And once again on a day that the Mercs got it wrong it was Daniel that stepped in to top the podium in their stead. Only he not in silver has triumphed this campaign. There were many star performers in Hungary and the flawless, rapid and crisply aggressive Ricciardo was chief among them. Alonso too was wonderful once again, as he somehow managed to hang onto second place by a fingernail, in a machine that most felt had no right to be anywhere near that place. He was aided at the last a little by the Mercs battling among themselves on the final lap; Lewis given everything justified in his uncompromising defence to maintain his P3. 'He (Rosberg) was catching me at three seconds a lap, so it was very, very tough at the end' noted Lewis with a little sangfroid. All of the top three seemed content with their afternoon's efforts and rightly so. For Alonso there was no regret at just missing out on a highly unlikely win, given his second place was about as unlikely. 'It was definitely a surprise' he said. 'We found ourselves leading the race when Ricciardo and Massa pitted so we thought OK, let's give the maximum for three or four laps just to open up a gap and stop see whether we are in the final part and then we realised that it was not so many laps to the end and it was a difficult call: stopping and keep pushing and finishing fourth or keep going and risking the cliff with the tyres and finishing fourth or fifth or whatever. So it was surprisingly good, it was surprisingly fast, the car in the race. 'Obviously this is damage limitation' said Lewis meanwhile. 'I'm very grateful to have been able to get through with all the difficulties I've had this weekend, obviously yesterday and the first lap. I can't believe how things have gone but to be able to come back through...'. Elsewhere he spoke with some poetry of giving 'the middle finger to adversity'. And he presumably 24 hours earlier would have bitten your hand off if offered a three point gain on Nico from his Hungarian visit. Nico however was a little rueful, particularly at getting stuck behind the first safety car - the point at which his day turned. There was also a sideshow during the race wherein Nico on a different strategy got vaguely near behind his team mate, and got a team call in his favour for Lewis to let him by. Lewis understandably didn't comply, as he was racing not only with Ricciardo and Alonso but as it transpired with Nico too, and the likely two seconds plus lost from yielding (to a guy that was hardly on his gearbox whatever was the case) would have condemned him to P4 at a point that he was focussed fully on winning. 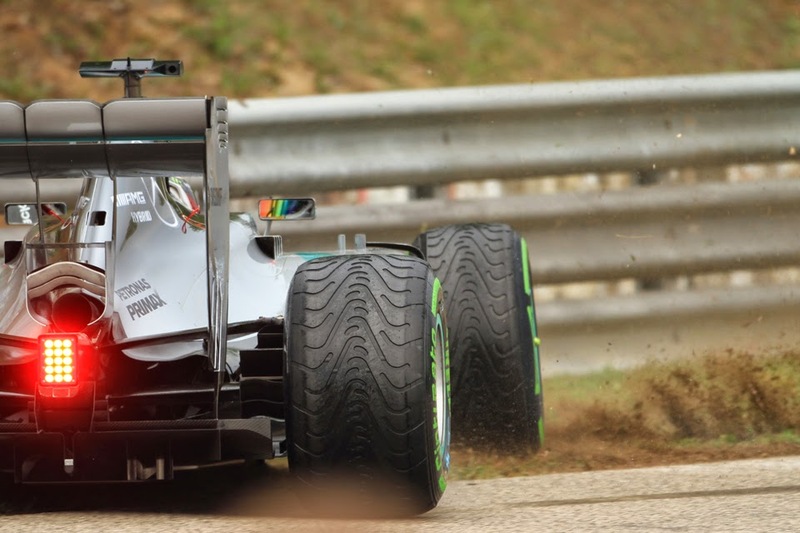 And Mercedes tells us it lets the drivers race - track position is part of the strategy calculation. Especially on this track. At the broader level however it is genuinely difficult to cite a previous top three though so monpolised by brilliant drives as this one. For all of its capacity of self-flagellation, there remains an awful lot good about this sport. 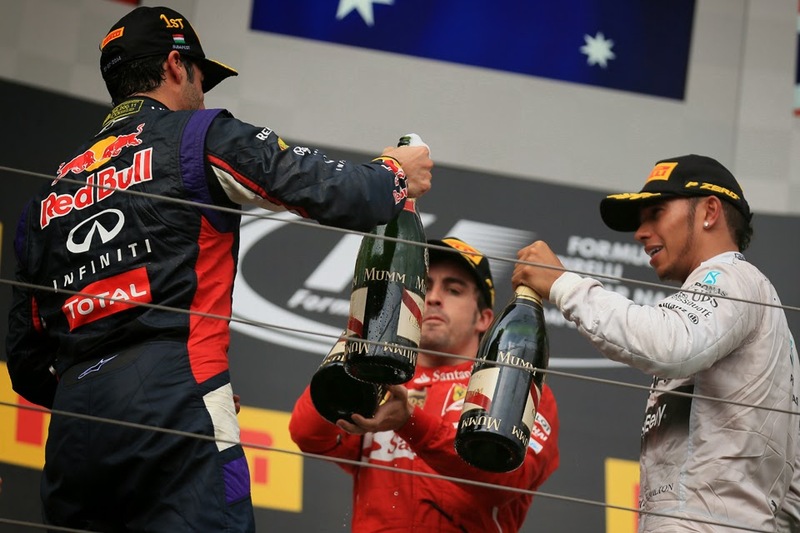 On the day before the race Ricciardo confirmed that despite the impending summer break he's not likely to return to Australia as a Grand Prix winner until Christmas time, He therefore joked that he'll have to win another, lest his compatriots forget in the meantime of his achievement. Mission accomplished quickly on that one. You rather suspect though that Australia, just like many of the rest of us, won't now forget about Daniel Ricciardo easily.